October is often a deadly wildfire month in California. In fact, 26 years ago today the Oakland Hills Fire ignited. The flames eventually killed 25 people. This year's death toll is 42 for the North Bay fires. The environment this time of year offers the perfect conditions for giant blazes to decimate the landscape. Californians often don't see a drop of rain all summer. Eventually there’s a cost to all those bluebird days. 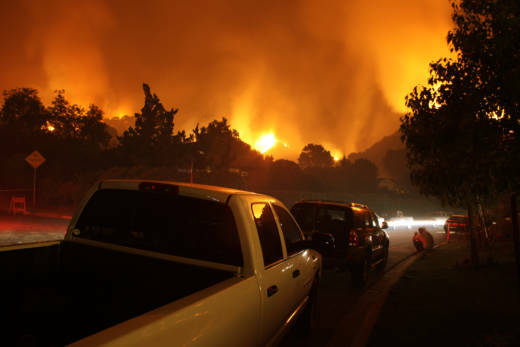 “By October California has dried out," said University of California, Berkeley fire expert William Stewart. "So every hillside is basically fuel waiting to burn." Of the 10 deadliest fires in California, 8 happened in October or November. Golden grasses and crispy shrubs become perfect kindling. Though Stewart didn’t expect Sonoma County to be the next hot spot. “Totally unexpected! said Stewart. "I mean if I was going to ask where do I think a fire will burn down into a community, it would not have been the north eastern corner of Santa Rosa." The ferocious flames were surprising because they started at night when it was relatively cool, and the brush in the area was less dense than what would typically trigger a catastrophic fire, like 1991’s East Bay tragedy. “The Oakland Hills had a lot of fuel," said Stewart. "They had forests with eucalyptus trees. They had big shrub fields. These all kind of burned according to fuel models." In other words, the Oakland fires burned as expected on a sizzling day. This year's fires surprised even the best experts. “During the transition into winter we tend to get high pressure systems that set up generally north and east of us over northern Nevada," said Alison Bridger, a meteorologist from San Jose State University. "And those generate offshore winds blowing from inland out to the Pacific Ocean. In the northern half of the state the autumn winds are often called Diablos named after the Diablo Range, in the East Bay. In Southern California they're called the Santa Ana winds. These hot dry winds often gather force by funneling down canyons, “And that certainly helps to form almost like a jet in the wind," said Bridger. Firefighters said embers could have flown more than a mile last week when flames were clocking 230 feet per second. Bridger expects massive wildfires like the Napa and Sonoma blazes to become more of the norm. Climate change is leading to rising temperatures, shorter snow seasons, longer droughts and more bark beetle infestations. This does not bode well for urban areas that are creeping closer to forests. “When you put all of that together I have no doubt that more and more acres are going to get burned," said Bridger. Unfortunately, October's fiery reputation could continue. Another heat wave is in the forecast next week.